Here’s a question worth pondering: What’s the most tragic mistake the mortal world can make? Not eating their vegetables? Staying up past bedtime? Or… (gasp!) lying to mom and dad!? It’s none of those, actually. The grave mistake on our mortal behalf would be to believe silly conclusions about the supernatural world, like the one that says that all Vampire Lords are towering, muscular Lotharios with beady eyes that pierce your thoughts and malevolent hearts that want your blood. You might think posting a few crosses on the doors and hanging a few cloves of garlic around would deter such a terrifying event, but even then… have you considered that the Vampire Lord might already be in your house? That’s right! 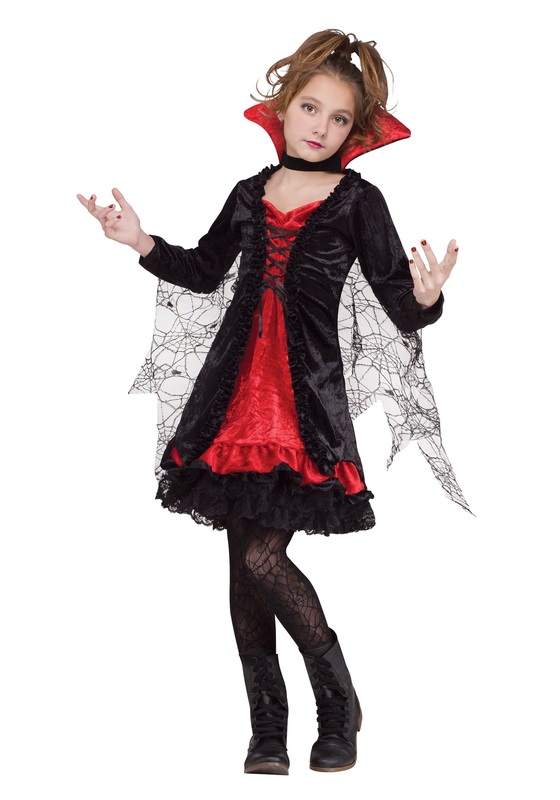 It seems that the charming eye of your tyke has pierced your headspace, pushed past your logic, and convinced you to find this elegant Vampire costume for her! The black and velvet fabric gives off an elegant and sophisticated vibe, even more so when your fanged kiddo waves her undead arms and fans out these knit mesh wings with finger loops. Trust us, paired with creepy accessories and some light makeup, it’s just what a young vampire would wear to a party, especially if she doesn’t drink… juice. I suppose you don’t have to trust us, though. You need only think long and hard about whether it’s really only you making this decision. Careful next time you see that sweet smile!